Monument Underway For Slain 1972 Israeli Olympians Frank Deford wonders why it took so long to build a monument commemorating the 11 Israeli athletes murdered by terrorists at the Munich Summer Olympics 43 years ago. 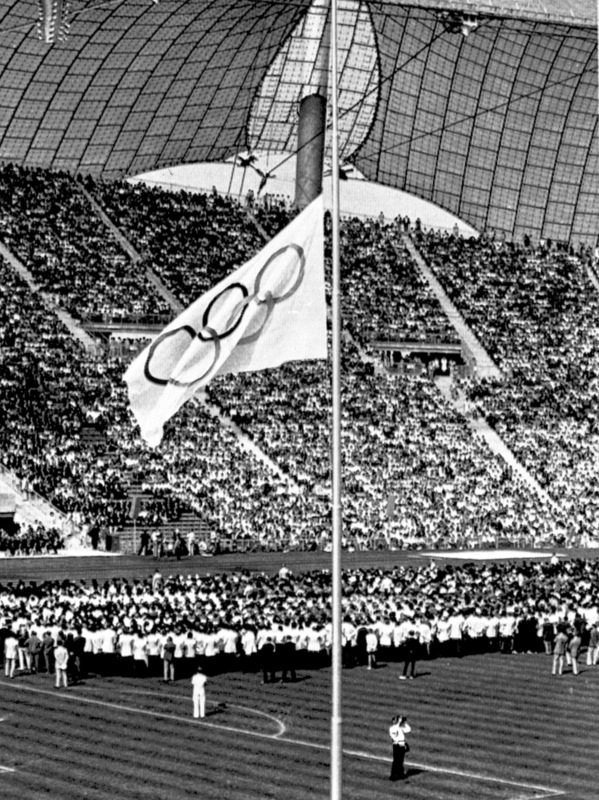 Olympic team members stand on the field as the Olympic flag flies at half-staff during a memorial service in the Munich Olympic Stadium in Germany on Sept. 6, 1972. Eleven Israeli team members were killed by Arab guerrillas at the Summer Olympic Games. A crowd of 80,000 filled the stadium to capacity. The spectacular global terrorism that's been so prominent lately can best be dated from 1972, when 11 Israeli Olympians were murdered at the Munich Games. That seminal atrocity has taken on even more horror, too, now that we've learned that some of the victims suffered mutilation and torture before they died. We may take some solace, though, that, after 43 years, the construction of a monument to the Israelis has finally begun and will be unveiled next October. Pointedly and poignantly, it stands barely more than a hundred yards from where the Israelis were first taken hostage. Of course, we have to ask again: Why in the world did it take more than four decades for the International Olympic Committee to build a memorial? Click the audio to hear Frank Deford's full commentary.